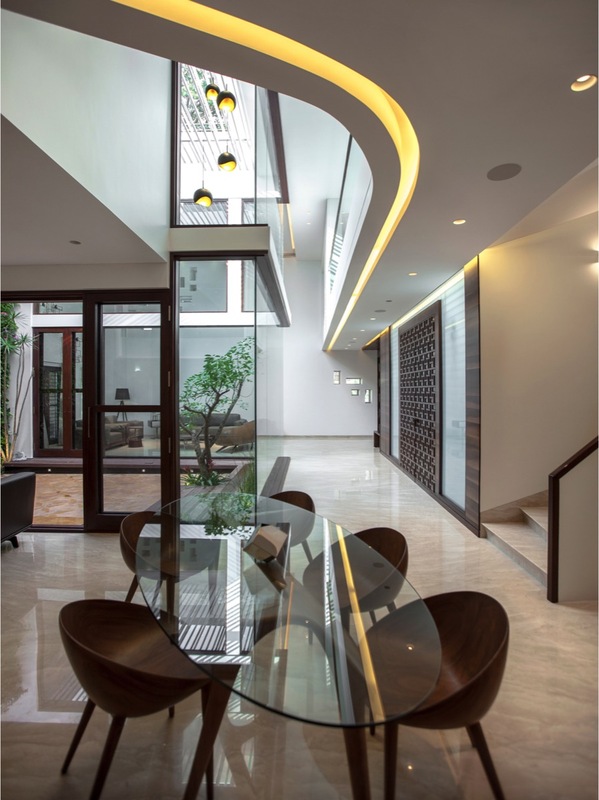 B1, Residence at Bengaluru, by Cadence Architects - ArchitectureLive! The residence sits in an urban fabric where the immediate context is a busy street and a lack of foliage for the house to respond to. 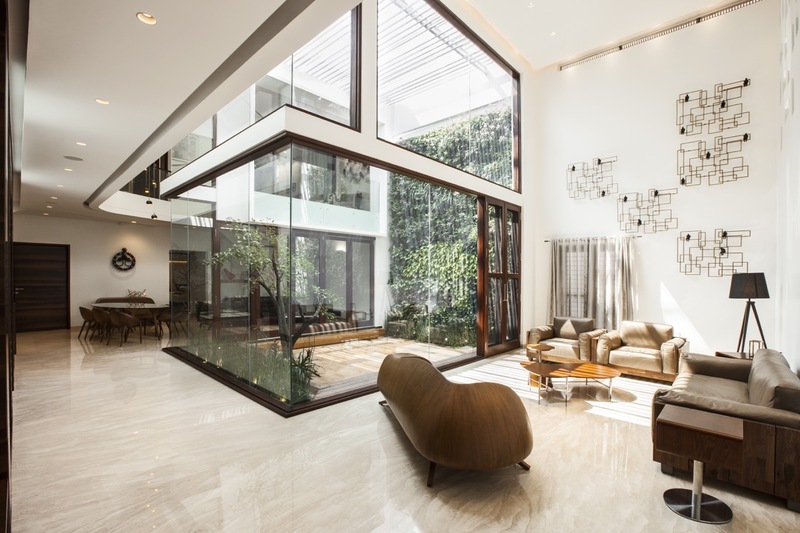 The house is designed on a plot measuring 45’x90’, located in a typical Indian neighbourhood flanking the busy street. 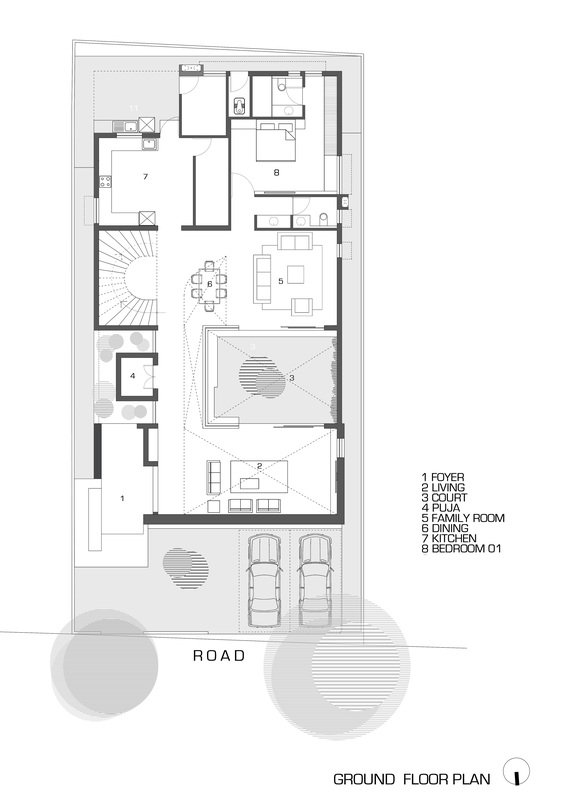 The dense residential fabric of the neighbourhood, proximity of the neighbours and the busy street in front prompted the conception of an introverted building. 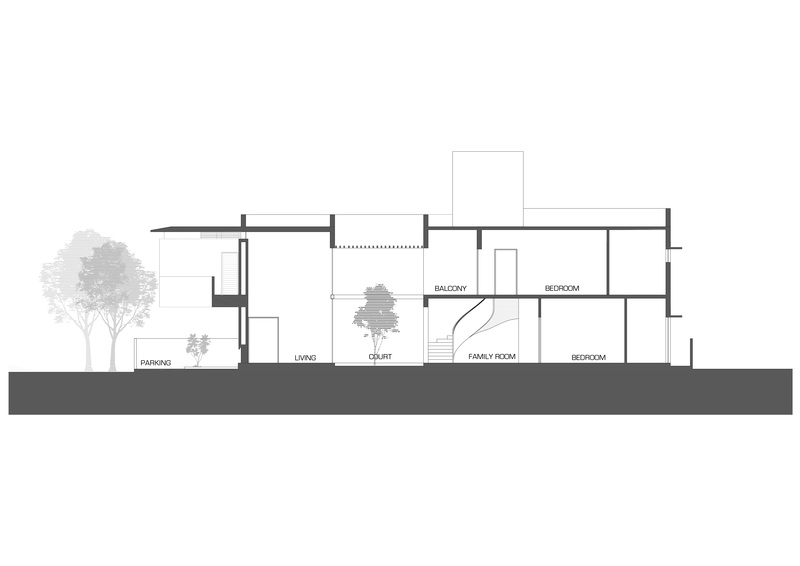 Diagrammatically, the program of the house is laid out in the form an ‘H-shaped plan’ that wraps around a courtyard such that each arm of the ‘H’ flanks the courtyard. 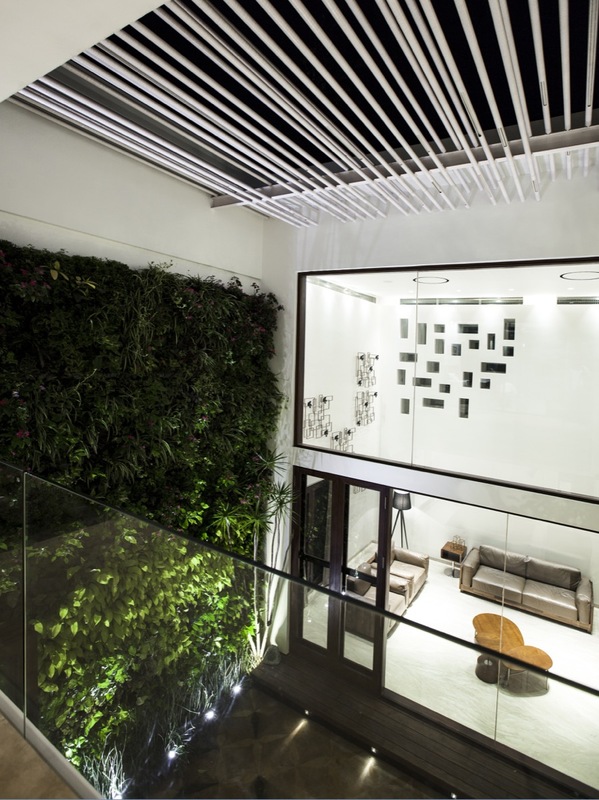 The open to sky courtyard, a highly sustainable element, not only becomes the point of interest and activity within the house, but also represents the ‘outside’ within the introverted house. The pergolas help shade the double height space and cut the glare, while the green wall helps in reducing the heat. The court is an oasis not just for light but for fresh air as well, where hot air escapes and fresh air comes through. 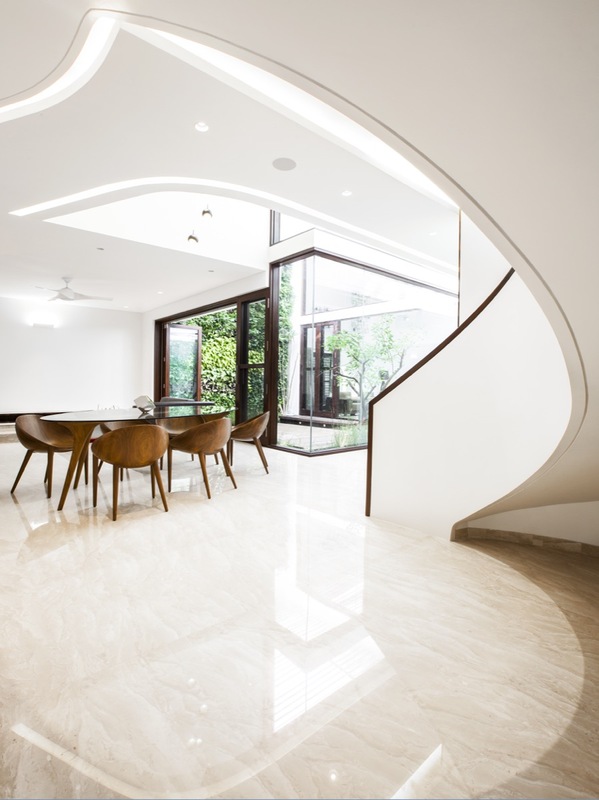 Acting as a light well, the court enables the user to have a macro oasis within the house. 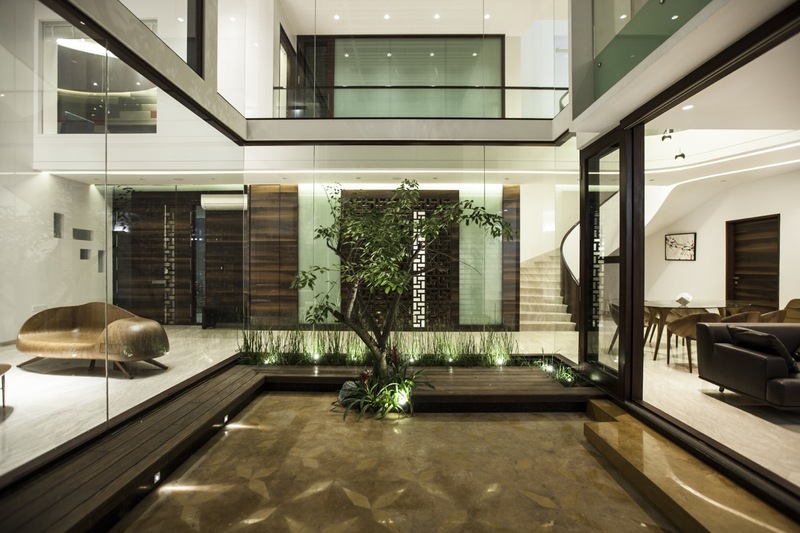 The interiority of the house is designed to revolve around the experience of the garden, similar to that of a conventional courtyard/thotti house. The program is expressed as horizontal bars across the courtyard. The puja room is further conceptualised as part of the courtyard; The puja and the courtyard together become the focus of the house for the various functions. 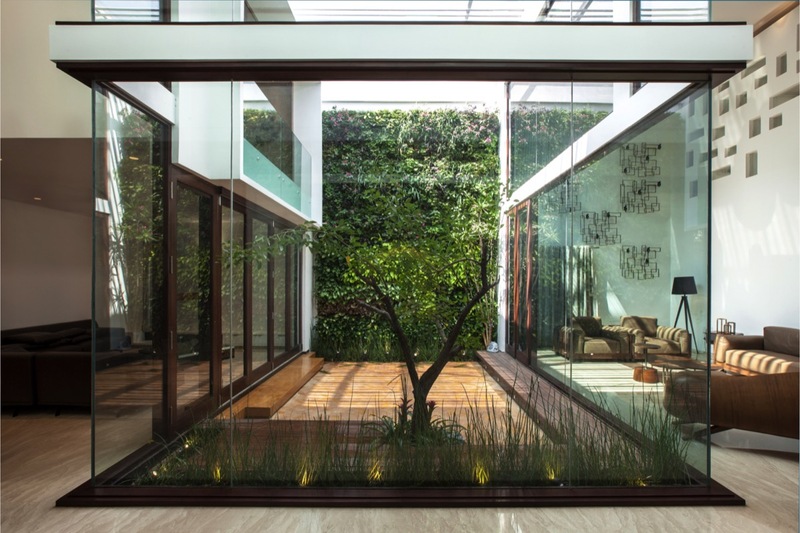 Due to its transparency, the courtyard also acts as an extension to all the functions around it. This along with the use of wood as a dominant material accentuates the warmth in all the spaces, with the furniture chosen to mimic installations in space. 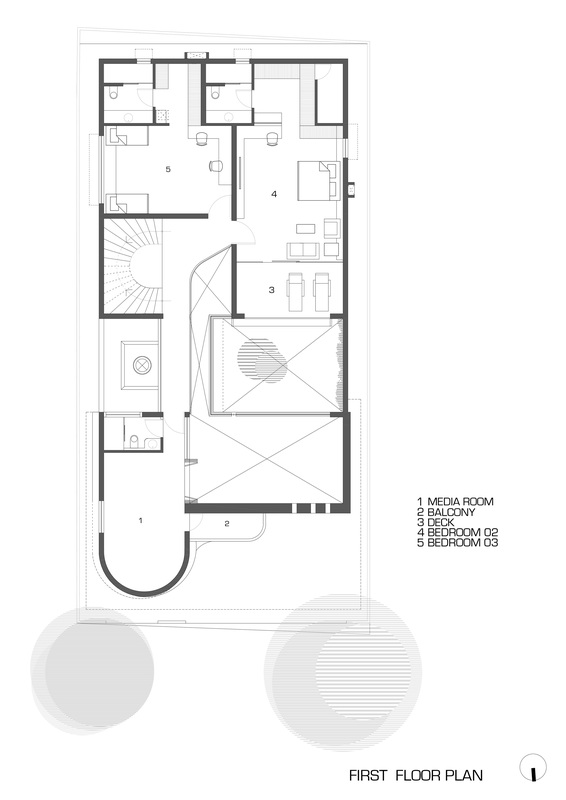 Deliberately attempting to move away from the conventional residential façade, no windows are provided. 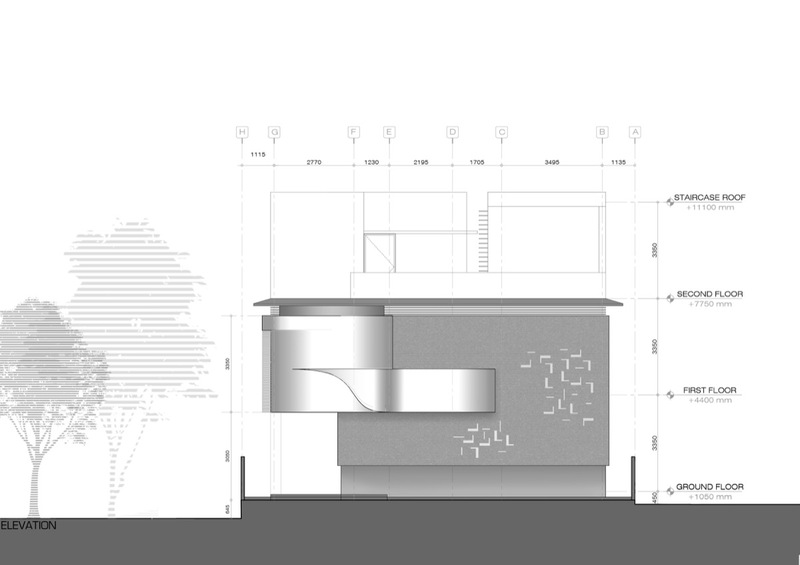 A blank wall with a dispersion of openings for the front facade emphasizes the introverted nature of the house and a large overhanging roof levitates above the mass. A sculpted object nestled between the roof and the ground below gives the residence a strong visual identity on the street. 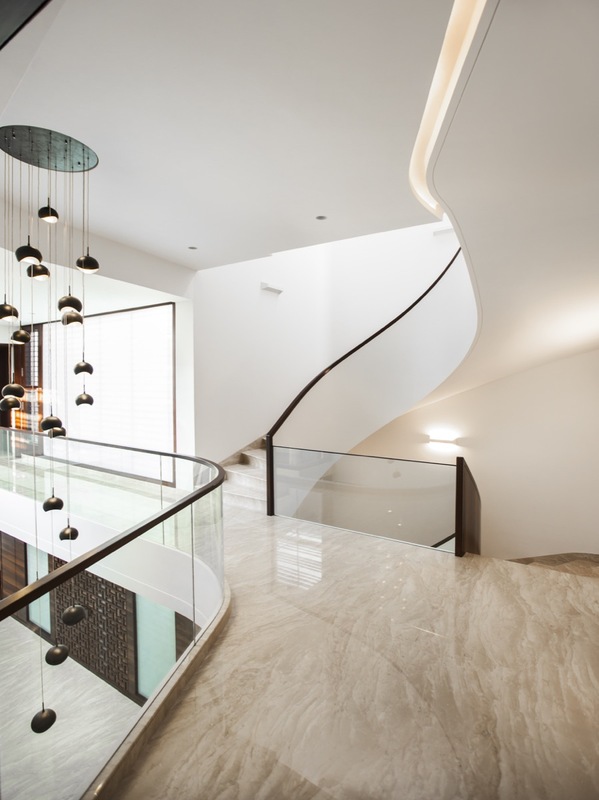 The vacuity within the heart of the house materialises on the facade as an undulating mass.. 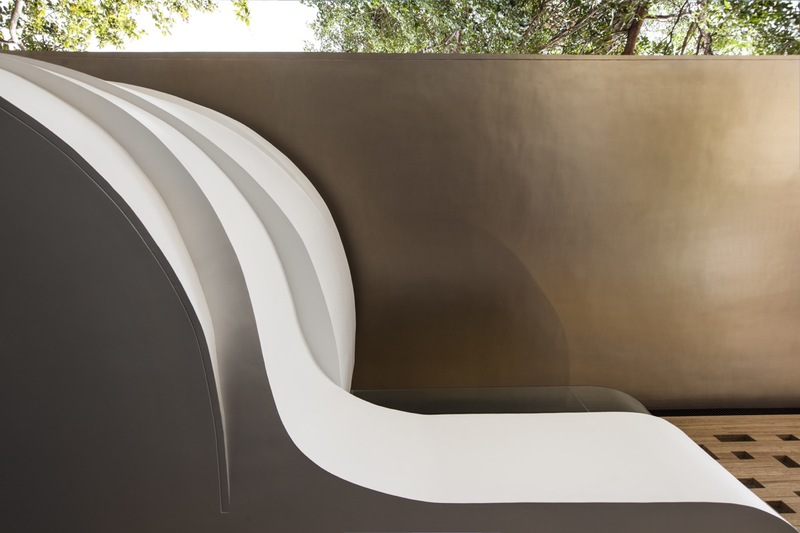 The contrast between the blank wall and the sculpted object is articulated in terms of materiality and form which helps stage one against the other. 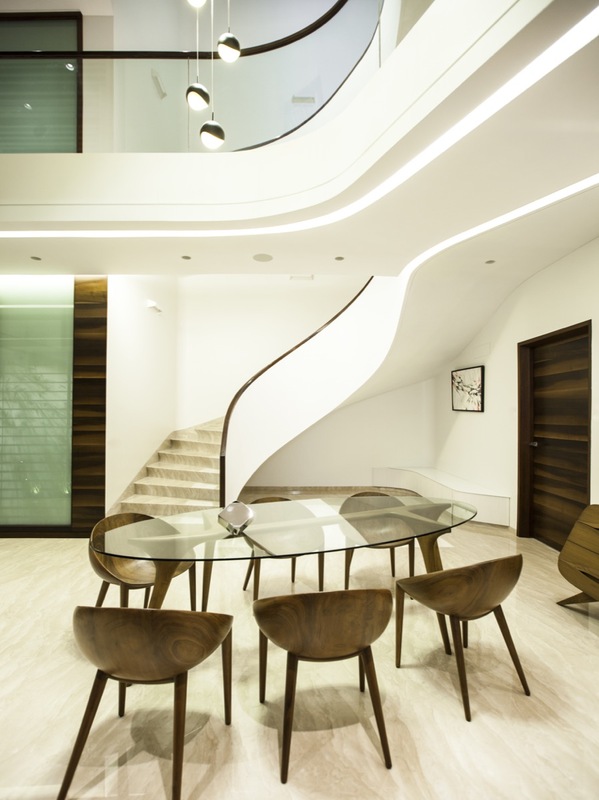 The house is self-sustainable with regard to the visual luxuriance and the quality of illumination. Site Area: 4000 sq. ft.
Built-Up Area: 5700 sq. ft.